Zweig, Eric. "Russell Martin". The Canadian Encyclopedia, 21 February 2017, Historica Canada. 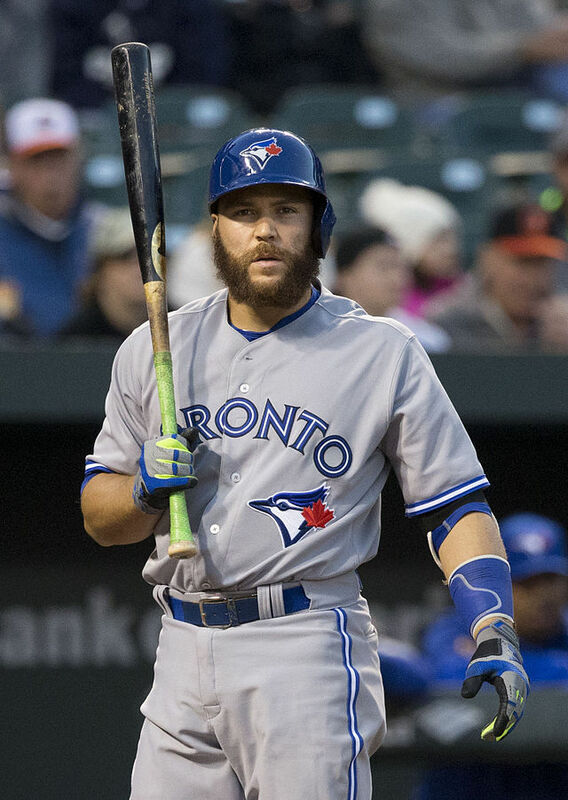 https://www.thecanadianencyclopedia.ca/en/article/russell-martin. Accessed 20 April 2019. Russell Martin is the son of Russell Martin, Sr., an African-Canadian saxophonist who was born near Montréal, and Suzanne Jeanson, a Franco-Manitoban actress and singer from just outside of Winnipeg. One of his middle names, Nathan, comes from his great-grandfather, while the other, Coltrane, is a tribute to jazz saxophonist John Coltrane. Although his parents were living in Toronto when he was born, the family soon moved to Winnipeg. Martin’s parents separated when he was two years old. He spent the next few years living with his mother in Chelsea, Québec, near Ottawa. After his mother remarried and had a daughter, Vivianne Jeanson Delorme, the family moved to Paris, France, where Martin lived from age eight to 10. During the summers, he lived with his father and played baseball in Montréal. Martin’s father (a gifted athlete who once tried out for a Canadian Football League team) had instilled a love of baseball and a strong work ethic in his son. Although his father’s main income was from busking in the Montréal Metro, father and son lived happily in the Notre-Dame-de-Grâce neighbourhood. In addition to playing baseball (shortstop) in high school, Martin also played minor hockey. Martin was still in high school when the Montreal Expos selected him in the 35th round of the 2000 Major League Baseball Draft. Though the Expos were the team he had grown up watching, he decided to pursue his education instead. Later that year, Martin hit .400 while playing for Team Canada at the IBAF World Junior Baseball Championship, leading to a scholarship to Chipola College, a junior college near Tallahassee, Florida. Only 17 years old, Martin struggled in his first season at Chipola College. However, he was inspired by the skill and work ethic of a teammate: future Toronto Blue Jays star José Bautista. After an improved second season, Martin graduated on the dean’s list and received a scholarship offer from North Carolina State University. However, when the Los Angeles Dodgers selected him in the 17th round of the 2002 draft, he chose professional baseball this time, receiving a $40,000 signing bonus. During the summer of 2002, Martin was the regular third baseman for the Gulf Coast League Dodgers rookie team in the Florida Gulf Coast League. However, he didn’t show the kind of hitting power that Major League teams look for in a third baseman and, since he had played catcher a few times at Chipola College, the Dodgers considered transitioning him to a full-time catcher. Convinced that he could make the Major Leagues faster as a catcher, Martin’s conversion began during spring training in 2003. That year, he played catcher for the Dodgers’ rookie ball farm club in Ogden, Utah, in the Pioneer League and with South Georgia in the Single-A South Atlantic League. He hit .286 in 25 games with South Georgia and batted .271 with 13 doubles, six homers and 36 RBI (runs batted in) in 52 games for Odgen while leading all Pioneer League catchers with 63 assists. In 2004, Martin was a non-roster invitee at spring training with the Dodgers and appeared in four exhibition games. He went on to be named a Florida State League All-Star with the Dodgers’ Single-A team in Vero Beach. Playing for the Double-A Jacksonville Suns in 2005, Martin was third in the Double-A Southern League with a .311 batting average and second with a .430 on-base percentage. He led his team to a league championship and was again named a league All-Star. In 2006, Martin was batting .297 in just 23 games with the Triple-A Las Vegas 51s in the Pacific Coast League. When Dodgers catcher (and future Blue Jays teammate) Dioner Navarro hurt his wrist, Martin was called to Los Angeles to make his Major League debut. 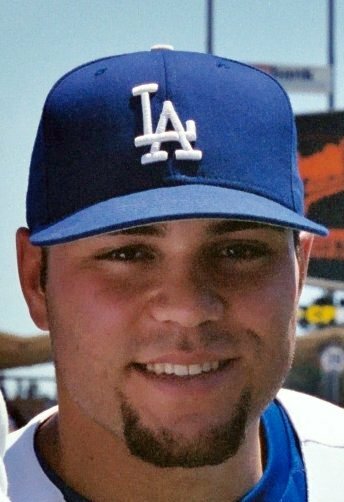 Russell Martin in his first season with the Los Angeles Dodgers, 26 July 2006. When Martin arrived in Los Angeles to play his first Major League game on 5 May 2006, he chose to wear number 55 to commemorate the date. Martin had two hits in his first MLB game, including a two-run double. Martin continued to perform well behind the plate, and on 26 June 2006, Los Angeles traded Navarro to Tampa Bay and made Martin the team’s number one catcher. That season, Martin hit .282, with 10 home runs, 26 doubles, 65 RBI, 65 runs scored and 10 stolen bases in just 121 games. The Dodgers marked Martin’s rookie year in the majors in a very special way: after discovering that his father was a musician, the team asked Martin Sr. to play the American national anthem at one of their home games in September 2006. “At that moment, watching him just kill it, I kind of shared the pride that he feels for me,” Martin later told Stephen Brunt. Martin put up even bigger numbers during his first full MLB season in 2007. He led all National League (NL) catchers in hits (157), home runs (19), runs (87), stolen bases (21), batting average (.297), on-base percentage (.380) and slugging percentage (.477) in 145 games behind the plate. He was voted the NL starting catcher at that year’s All-Star Game and became the third catcher in NL history (joining Gary Carter and Benito Santiago) to win a Gold Glove Award and Silver Slugger Award. Martin had another big season in 2008, helping the Dodgers win the NL West division, but then slumped in 2009. His numbers continued to decline in 2010, when a hip injury cut his season short. Because of his injury and declining production, the Dodgers offered Martin a one-year contract in 2011 for $4.2 million — less than the $5 million he made in 2010. He chose to become a free agent instead. Russell Martin, 24 April, 2011. 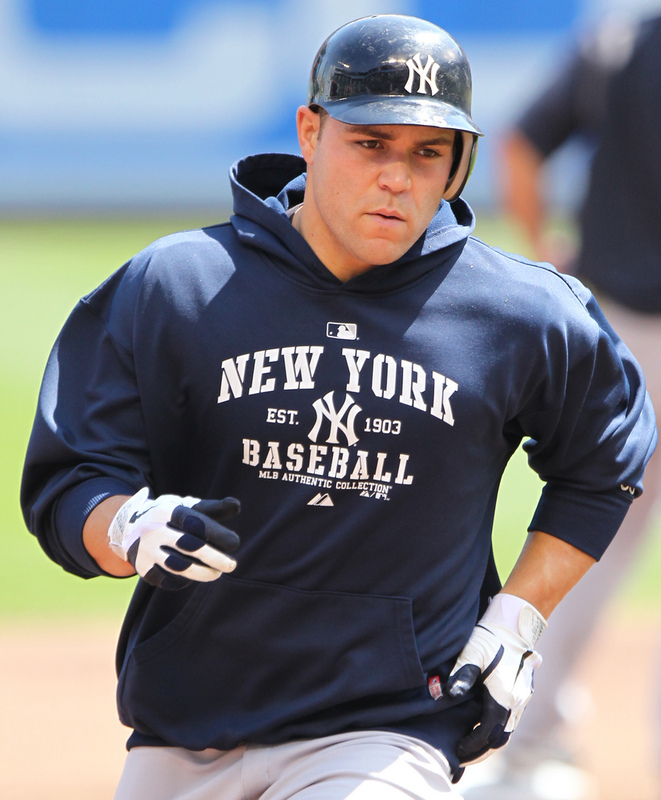 Martin signed with the New York Yankees for the 2011 season, receiving a $4 million base salary with incentives. He enjoyed a bounce-back season, playing in 125 games, including 118 as the starting catcher. Although his batting average was only .237, he had 18 home runs and 65 RBI and led all Major League catchers by throwing out 35 runners attempting to steal. The Yankees won the American League (AL) East that season and again in 2012, when Martin hit 21 home runs, the highest in his career to that date. He signed a one-year contract worth $7.5 million for 2012 but became a free agent again after that season. The Pittsburgh Pirates signed Martin to a two-year deal, paying him a $2 million signing bonus and a salary of $6.5 million in 2013 and $8.5 million in 2014. Pittsburgh hadn’t made the playoffs since 1992, but Martin’s steadying influence helped the Pirates earn an NL Wild Card berth in both of his seasons with the team. Martin hit only .226 in 2013 but had 15 home runs and 55 RBI. More importantly, his defence and his ability to handle the Pirates’ pitching staff were stellar. He threw out 29 of 70 runners attempting to steal — a Major League best — and led all NL catchers with a .998 fielding percentage, making just two errors in 990 changes. Pittsburgh pitchers compiled a 3.14 ERA (earned run average) when he was behind the plate, which was second best among all Major League catchers, with at least 100 games played. In the playoffs, Martin hit two home runs to lead the Pirates to a 6–2 victory over Cincinnati in the NL Wild Card game. In 2014, his batting average improved to .290 — just shy of his career best of .293 from 2007 — and he led all catchers with a .406 on-base percentage. He ranked third in the National League, with a .360 average with runners in scoring position, and threw out 28 baserunners. 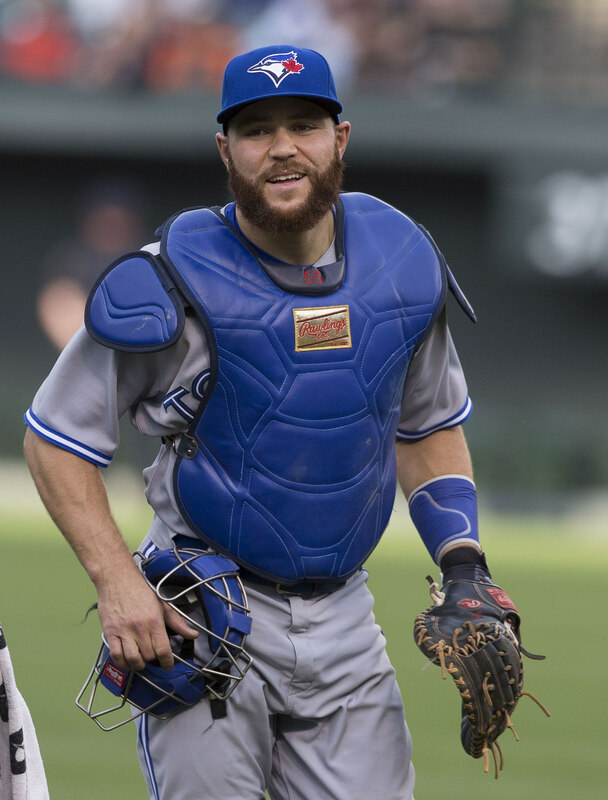 Russell Martin, 11 May 2015. On 18 November 2014, the Toronto Blue Jays announced that they had signed Martin to a five-year, $82 million contract. His leadership and playoff pedigree (like that of Josh Donaldson, who was picked up in a trade 10 days later) made him a key acquisition for a team that hadn’t reached the playoffs since winning back-to-back World Series titles in 1992 and 1993. 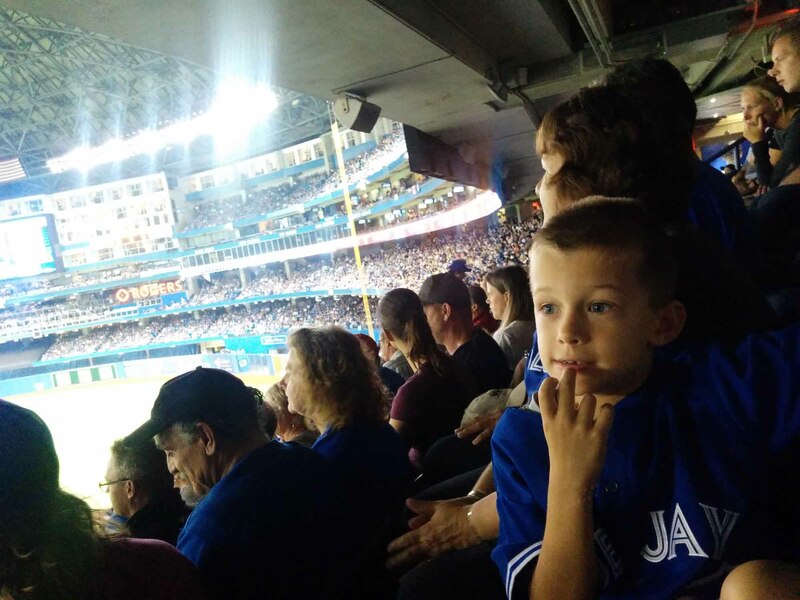 On 3 April 2015, Martin’s father played both the Canadian and American national anthems before an exhibition game between the Blue Jays and Cincinnati Reds at Olympic Stadium in Montréal. Martin Sr. was given a standing ovation by the crowd of more than 46,000 fans. The Jays lost 2–0. Despite having to work with a new pitching staff, Martin had a solid season in 2015. He threw out 25 of 65 attempted base stealers while establishing a career high with 23 home runs. His 77 RBI were his most since 2007, when he had set a personal best of 87. He was selected to represent the American League in the All-Star Game and was a finalist for the Gold Glove Award. Most importantly, Martin helped Toronto return to the playoffs by winning the AL East Division. The Blue Jays defeated the Texas Rangers in the Division Series before losing to the eventual World Series champion Kansas City Royals in the American League Championship Series. After a slow start in 2016, Martin found his rhythm by June. He was especially strong in August, hitting .286 with nine home runs and 22 RBI in 24 games, leading the team to a 17–11 record and first place in the AL East. He slumped again in September, hitting only .161 for the month. However, he finished the season with 20 home runs and 74 RBI when Toronto returned to the playoffs, defeating Baltimore 5–2 in 11 innings in a thrilling Wild Card game. Having played 137 games ­­— his most in a season since 2010 — Martin continued to battle fatigue and had just three hits in 33 playoff at-bats. The Blue Jays swept the Rangers in the Division Series but lost the American League Championship Series to Cleveland. In addition to playing at the IBAF World Junior Baseball Championship in 2000, Martin represented Canada at a 2003 tournament in Panama in which the team qualified for the 2004 Olympic Summer Games (though he didn’t compete at the Olympic Games). He also played for Canada at the 2009 World Baseball Classic, a tournament of the best players from baseball-playing nations, and hit a home run against the United States at the Rogers Centre in Toronto. In the off-season, Martin returns to Montréal to be with friends and family, including his parents and his sister, singer Vivianne Jeanson Delorme. According to his mother, Suzanne Jeanson, Martin has an artistic side as well and loves art, singing and playing drums and guitar.